Carbone Plumbing and Heating Corp.
High-use businesses such as laundromats rely upon us to keep their equipment running its best…and so can you! 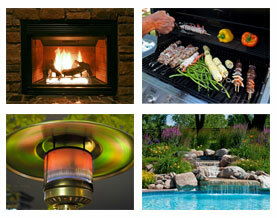 Carbone Plumbing and Heating is your one-stop shopping center for fireplaces and outdoor appliances. From running your gas line to supplying and installing your unit, we take care of everything! Napoleon – Napoleon offers an extensive line of wood, gas, oil and pellet burning fireplaces, freestanding stoves, inserts, waterfalls and related hearth accessories. With Napoleon, homeowners have the assurance of high quality, durability and service. Their products continuously surpass industry standards in appearance, efficiency and performance. Innovative engineering and design, advanced manufacturing techniques, dedicated customer service, outstanding product quality, and superior warranties distinguish Napoleon from its competitors. Robert H Peterson – Robert H. Peterson’s Real-Fyre gas logs are manufactured to exacting specifications and the highest standards. All Real-Fyre gas log sets are detailed with high definition bark and natural colors for authentic wood realism. Real-Fyre gas logs burn cleaner than smoke-producing wood fires, reducing pollution. Their beauty and warmth provide comfort and pleasure for as long as you own your home.